Recknagel are a German based company specialising in producing high quality precision made scope mounts, gun parts, gun furniture and more. We are seeing a rise in popularity and excellent feedback on the Recknagel Picatinny Rails and Picatinny Rings. The Latest Product from Recknagel - The SOB01 and SOB02 Silencer. 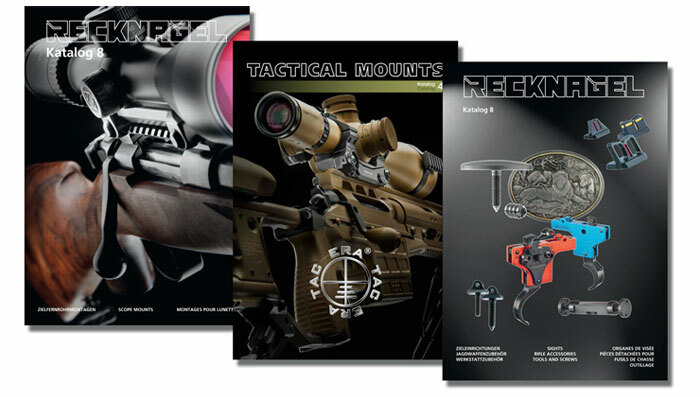 The Recknagel Catalogue has thousands of precision made parts and components for scope mounting, custom gun making and more. You can browse the current catalogue including the latest Tactical Catalogue. With the vast Recknagel Catalogue, we are always	able to find a scope mount solution. There are a wide range of sizes, heights, materials and styles available. Sometimes it's best to talk to the experts to get an overview of the possibilities and the best solution for your scope mounting enquiry. We are always on hand to help you select the correct parts for your scope mounting solution. The most common questions we get asked are, what heights and parts do I need? This can vary from rifle model and scope model/size. We have put together a step-by-step instructional section for getting the correct height mounting using the picatinny rail and rings system. See the Getting the Correct Height Instructions for Picatinny Rail and Rings. The full range of Recknagel scope mounts, parts, gun furniture and accessories are listed in full in the Catalogue. It is available to download and browse, but if you would like any advise, please contact us for more information. If you cannot find a rail for your rifle, try looking at our Picatinny Rail List. This has a complete list of the rifle models we supply rails for, including part numbers, heights and hole spacing.